It would be cool to see the 1996 picture with arrows or shapes showing where something changed. (like Founders, etc) Especially for those who have not lived in GR that long and have no idea. Here's a couple of neat photos from this thread a dozen years ago. I've added some arrows and texts to identify current landmarks in one of the photos in the doctored photo at the bottom. The tags represent what is there now. What is now Founders was the Interstate Motor Freight terminal. What is now the Intersection Bar was a truck dealer. I think I've identified the New Mertens correctly but not 100% sure. The Intersection is a good marker because it now butts up against the curve in 131. Don't know where the black lines came from, sorry. This is apparently what people looked at before Google Satellite view. Just a little fun this afternoon. 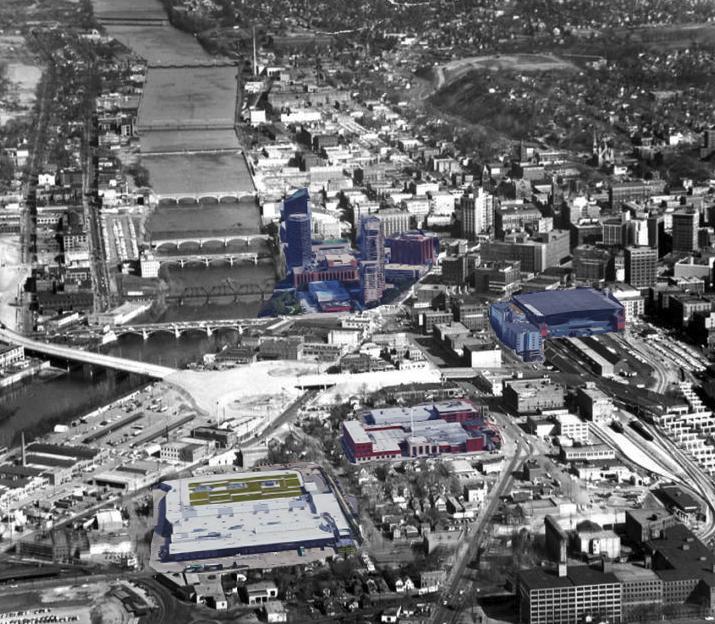 Wow, look at the west side, where the Ford museum and GVSU is now. Looks all industrial…then look two blocks west further from the river. Is that just open space? Well, it was open space after the highway department got to it! Man, I wish there were more photos or film of these outer parts of the central city available online. It seems like we only ever see the same shots from the same vantage points while these edge areas are just as developed, but we have no real idea what they looked like from the ground. Aha, good point on that. I could look at for hours, too bad you can't zoom in to get better resolution. I would love to go street by street to see what the building were like. 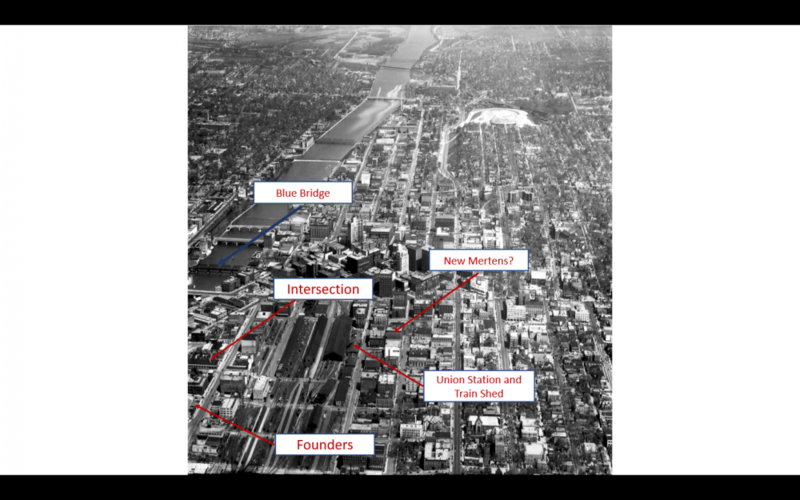 I think I remember seeing it in that old book "Grand Rapids: Then and Now". It's where Guiding Light Mission is, and it was a fairly fancy home (mansion?). Likely something more than that. 1) In addition to US-131 not being put in yet, I-196 is also not under construction yet. 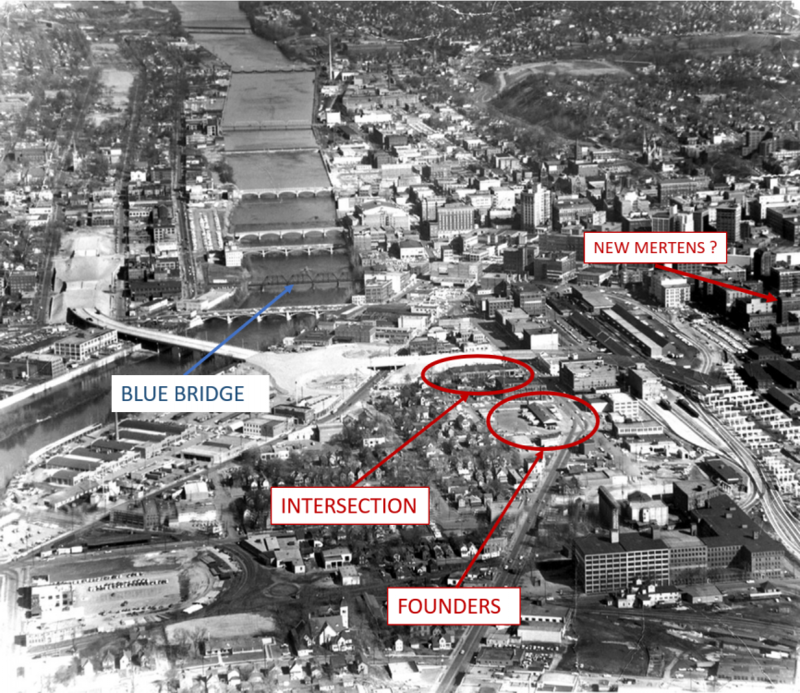 2) At the very top of the photo, you can see the GR & Eastern Rail bridge and the Ann Street bridge. Beyond (north) of that, there is very little. Alpine certainly hadn't developed into what it is today, and there isn't the growth that is currently on both sides of the river. Essentially, northern city sprawl ended at Ann Street. The building that is where the Hinman development is going was quite large for that area. Does anyone know the story of that building? I know it got converted to a parked ramp (the building itself), then eventually demolished. Surprised a building that size fell out of favor that quickly when most of the taller structures downtown made it through urban renewal. Turned up pages and pages of thumbnail photos of Grand Rapids from all eras, most I've never seen before. 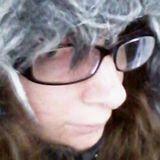 And you can click on them to enlarge and there is a slider to expand a photo even more. tSlater asks "What is that building across Division from St. Andrew's, where Guiding Light is now? (in the pre-highway pic)"
It's the South Division Street School. 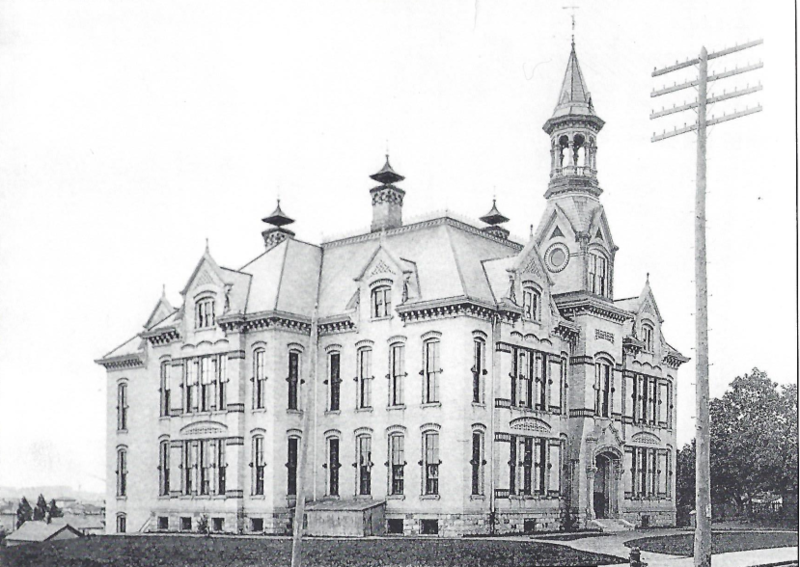 It was completed in 1884 at a cost of $34,000 and was the biggest elementary school in the city at the time. In its later years it was used for storage. It was torn down in 1948. In 1962 the current building on the site, which is now the Guiding Light Mission, was built as the state unemployment office. to back fill what was a duplicate post. Someone noted back in 2008 that Chris had said 10 Ionia SW when it is actually 10 Ionia NW. Anyone else notice that I-196 is NOT in this picture! I was actually wondering if anyone knew the story behind the story. It’s surprising that a 12 story building met the wrecking ball. Maybe it was always a no frills building (since it was a factory), and expendable. Or it never had office tenants, so it was an easy target. As far as I can tell, it’s the biggest building to get knocked down in that era. It wasn't the core in the late 70s though. Calder Plaza was the core, the area south of Monroe Center was mainly parking for Monroe Center, and everything south of Fulton was derelict. At 12 stories, it probably felt like looming blight, especially in an era when much more architecturally interesting buildings were considered obsolete. That's the area where the gas works was (current DTE building and property). Hadn’t heard about this building. Photos? Maybe it was haunted. Don't know why the Jefferson building was torn down but considering how they stressed in their ads how the Morton House was fire proof, maybe they had a fire or it was condemned as unsafe. Regarding the shoe factory, Morten took it over as its parking ramp, then after that they sold it to a realty company, who used it for public parking for a while. By the time it was torn down it had been abandoned for about 5-10 years. The company that owned it likely had no idea what to do with it. It probably looked as inviting as the old A&P building at that time. I doubt that the hospital was ever as big as the post card rendering at the top since their locations before and after this building were much smaller and because there is no photo showing that large a building, although there are the thumbnails that show the front of the building only. I think inflating the size of building must have been a “thing” back then. I remember looking at an old ad/brochure for the furniture exhibition and they took a lot liberties, increasing height and moving buildings closer together. It made GR look like a small Chicago or New York. I remember having seen an aerial photo of the city at one point (have no idea how to find it now) that was taken while the Burleson at Jefferson stood, and it was definitely a significant structure, more likely accurately depicted by the post cards. The sign on the Morton though has been confirmed not to have ever existed.